Vertical drift measurements have been made at Jicamarca for more than half a solar cycle. The data from periods of high and low activity are appreciably different. Daytime drift velocities during sunspot minimum are usually larger than during the maximum, while the opposite is true for nighttime periods. The evening reversal occurs earlier during sunspot minimum than during the maximum, but the morning reversal is not altered. The period of eastward electric field (upward drift) is thus shortest during sunspot minimum and local winter. By integrating the drift velocity data with respect to time, one can obtain a measure of the total potential drop between reversal points (near the terminators). This drop is largest at solar maximum. There is also a pronounced seasonal variation, with a minimum in mid-December during both solar minimum and maximum. The general features of the data cannot be explained solely on the basis of tidal winds driving an E region dynamo; polarization fields related to the F region dynamo are of major importance, particularly in helping to explain the enhancement of the daytime upward drift which often occurs shortly before the drift reverses to downward in the evening. In order to account quantitatively for the observed variations, however, numerical models considerably more sophisticated than those presently available are needed. 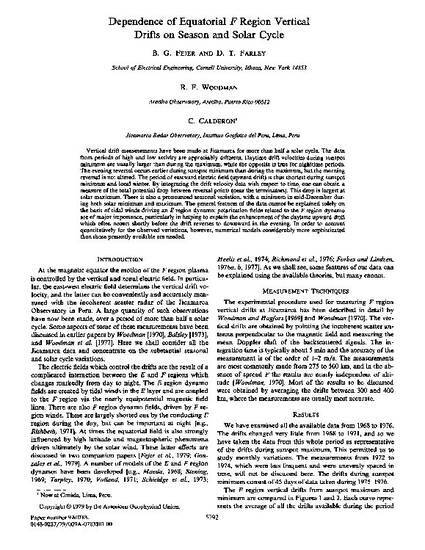 Fejer, B. G., D. T. Farley, R. F. Woodman, and C. A. Calderon, Dependence of equatorial F region vertical drifts on season and solar cycle, J. Geophys. Res., 84, 5792, 1979.